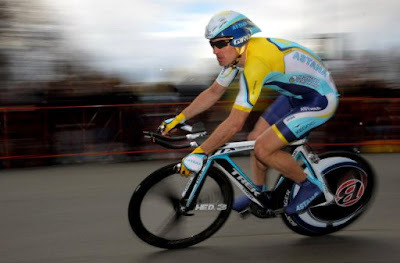 LOS ANGELES, USA -- Ukrainian cyclist Yaroslav Popovych, a former teammate of Lance Armstrong, testified for 90 minutes before a grand jury that is probing doping in the sport, his lawyer said. Ukrainian cyclist Yaroslav Popovych has been a rider on three Armstrong teams since 2005. Popovych's lawyer, Ken Miller, told the Los Angeles Times that his client was forced to testify on Wednesday after being served while riding in a charity event put on by Armstrong in Austin, Texas. "How he was served struck me as a little peculiar," Miller told the newspaper. "It was effected on a guy at a charity ride who was going to leave Texas for a vacation with his girlfriend. A guy from Ukraine who doesn't speak great English and didn't really understand what was going on." Miller added that he doesn't think his client has anything to add to the doping probe. "I don't believe he knows anything about what the grand jury is investigating," he said. Investigators want to talk to the 30-year-old Ukrainian cyclist because he has been a rider on three Armstrong teams since 2005, when they both rode for Discovery Channel. Federal prosecutors have called several associates of Armstrong, a seven-time Tour de France champion, in recent weeks. Investigators have been interviewing witnesses and collecting evidence in their probe of whether or not Armstrong took banned substances. Armstrong has repeatedly denied the allegations. Testimony is kept secret and sessions are closed to reporters. The federal probe was sparked by allegations from Armstrong's countryman and former cycling teammate Floyd Landis that Armstrong used performance-enhancing drugs.